I am writing this post a few days prior to leaving for a ten day mission trip to Brazil. I have a ton of packing to do and my list of what needs to be done before I go is growing. Also, it seems at every turn our team is dodging Satan’s darts. We have people sick, some with family issues, and my extended family is facing a major financial burden. Then, we are still waiting on the approval of our Visas. However, our team is excited. Why? God has called us to go and share His love. I love the fact that Jesus commands us to “go.” He does not want us to sit in our church pews and do the “church” thing. Yes, Jesus wants us to be faithful to his bride the Church but He also wants us to get our hands dirty in ministry. In order to get our hands dirty in ministry or missions, we must be willing to leave our comfort zone. Now, the Lord has not pricked my heart to go to the deep jungles, but He has given me a heart to go and tell the world about Him. My first visit to Brazil took place about ten years ago. I traveled with my husband, then the Partnership Missions Director for the Arkansas Baptist State Convention. He went to set the groundwork for future mission groups. It was then that God opened my heart to see the hungry hearts of the Brazilian people. They are deeply spiritual; however, they often combine Christianity with cults, witchcraft, etc. Because of this issue, the Brazilian Baptist Christians are intentional in disciplining their new converts. As we leave in a few days, I covet your prayers for our team. Pray for our safety, health, and for our families back home. (My husband and I are expecting our second grandchild on June 18th so we are praying Baby Lee #2 does not come while we are gone). Pray for the Brazilian missionaries and pastors as the share Jesus. Pray for open hearts to come to know Christ as their Savior. Recently, I had lunch with one of my new staff wives . However, while we were discussing where to have lunch, we both commented that we hated making decisions no matter how big or small. At the same time, we laughed and said, “What you too?” With the fact that we hate making decision and that we are both chocoholics, we can firmly say our friendship is sealed. It does take time to forge a friendship especially when you are ministry. You must test the waters to see who can be trusted. You must spend some time with the person to decide if this relationship could be of mutual encouragement or a toxic one. I cannot tell you how many times I have started investing in a friendship only to discover the person is simply using me to get the “inside scoop.” I have walked away from a very toxic friendship with a fellow pastor’s wife because she was draining me of my joy in ministry. Friendships should never seek to destroy or to get information for gossip. Friendships are to build one another up through the good times and the difficult times. That is why I love it when I know a friendship is going to work out. As we get to know one another, the discussion often comes around to silly questions or things that we do. That is why I know my friendship is secure with my new staff wife. We HATE making decisions. I would love to hear your “What! You too?” friendship story. As for my new friend, we did decide one thing at lunch today. We will let someone else tell us where to have lunch next time. As a minister’s wife, I often find myself in battles. I fight a daily battle in limiting my chocolate intake. I rage war against the daily duties of juggling home life, family life, and church life. I wrestle against the ruler of the world for my spiritual life. What happens when our plans for the day do not match God’s plan for our day? Let’s break it down a minute and see if any of these scenarios sound familiar. (Every one of these scenarios has happened to me). *You really want to travel out of country for a mission trip and start the paperwork. A couple of weeks before the trip, you get sick or suffer an injury that keeps you at home. *You work hard all day at your job and want a quiet evening at home. Instead you spend your evening at the hospital with a sick church member or your child informs you that he/she has a huge project due the next day. *You are in the midst of spring cleaning the house. Closets are emptied and the contents on the floor. Bed linens are washing. There are boxes marked for Goodwill, trash, and keep in the living room. In other words, the house is a mess. The door bell rings. You open it to find friends who are passing through town and have decided to come for a surprise visit. To be quite honest, often I begin my day without seeking what the Lord might need me to do. I simply start my day “swimming upstream” thinking I can manage the current. Before long I am in some treacherous water. My patience runs thin. I am irritable with my family. My stress level is at the explosion point. I am slowly learning that doing things my way is not the Lord’s way. When I start my day without spending time with the Lord, I fight a never-ending spiritual battle. While Satan pulls at me one way, the Lord is calling me to surrender to Him. Some days I am so in tune to the Lord that I can feel Him next to me. On other days, I barely keep my head above the crushing waves of life. As a pastor’s wife, I have discovered that when I am in those treacherous waters of life and doing my own thing, I can desperately utter the name of Jesus and He will throw me a rescue ring. My sisters, I would like to request your prayers for an upcoming mission trip to Jamaica that I plan to take along with my husband and youngest daughter. The Lord has once again given me an opportunity to go to this beautiful country, to the inland community of Linstead, to be used by the Lord to be a witness for Him. Also, I am asking the Lord to truly do an impacting work in the hearts of two of our church members who will be a part of this mission trip team. I am so excited about all that our Savior will accomplish as we go to another part of the world to serve others and, by the power of the Holy Spirit, be witnesses for Him. To God Be the Glory for all that He will do in Jamaica! What do these things have in common? I know them to be instant agents of joy that bring “pockets of peace” when I may be having a really, really bad day! I define a “pocket of peace” as those seemingly insignificant things that the Lord drops into your day when you least expect it, but the impact that they have is priceless. We all have really, really bad days occasionally, even though we know that we belong to Christ and are secure in Him. At times, simply living life throws us curve balls, and we just don’t see them coming! Yes, Jesus said that in this life we will have trouble, but He also told us to be encouraged because HE has overcome the world. Yes, the apostle Peter told us that we are to not think it strange when fiery trials come upon us, but he told us that we share in the sufferings of Christ and we are to rejoice. Yes, as Christians we are going to suffer, yet also the apostle Peter tells us that we are not to be ashamed in our suffering, but to glorify God. Life can get very hard at times, but the one thing that I have come to rely on and appreciate more in my life is the peace of Christ as I am living through difficult situations. Before He went to the cross, Jesus told his disciples, “Peace I leave with you; My peace I give to you; not as the world gives do I give to you. Do not let your heart be troubled, nor let it be fearful.” John 14:27 Anything the world wants to give us pales in comparison to what our Savior can give. His peace is lasting, His peace is genuine, and His peace will melt away distress and fear in our hearts. I know that to be so true in my life, as I have experienced that very recently. The apostle Paul urged us to,“Be anxious for nothing, but in everything by prayer and supplication with thanksgiving let your requests be made known to God. And the peace of God, which surpasses all comprehension, will guard your hearts and your minds in Christ Jesus.” Philippians 4:6-7 Nothing can rip peace away from us like an anxious heart, a heart full of worry, doubt, fear, and unbelief. The best thing that I have found for calming a troubled heart is found in prayer, talking with my Father, through prayers of adoration, confession, thanksgiving, and petition, telling Him the things that are burdening my heart. When I do this, the promise found in Philippians 4:7 floods my mind and spirit, and I do experience a supernatural peace that is so incredible. So when you are having a bad day, look for those “pockets of peace” that our Loving Father sends your way; receive them with joy. May the Lord use them to whisper to your heart, in a still small voice, that you are loved, perfectly and completely. I know that you are like me and see death and sickness all around you. It is everywhere. BUT....lately, it just seems like we have experienced more and more strokes. January 4th, one of our 48 year old ladies suddenly could not feel her foot or legs and had tingling. She called her doctor and he told her to go to the ER. There they stablized her and sent her to a larger hospital, where they did an MRI. The doctor read the MRI and came and to talk to her and her boyfriend. In short, she was told she had a large navel orange size brain tumor.....and it was cancer. They has gone threw radiation and chemo.........they did more tests and are giving hr 6 months to a year to live. A week and half ago, the twenty year old cousin of our daughter-in-law was rushed to the hospital and then airlifted to UT Hospital, where they found she had a large blood clot at the base of her brain. They decided to try to dissolve it since surgery would be so dangerous They were able to dissolve it and she is doing much better. A week ago, a 42 year old daughter of our school janitor was found knocked out and non-responsive. She was taken by ambulance to the hospital and then airlifted to a larger hospital. She did not make it. She left three children. Sunday, more of our members Nanny had a massive stroke. She is 81 years old and the doctors only gave her a 10% chance of surviving. Today, she responded on command and even weakly said the word stroke when asked if she knew what happened to her. It doesn't matter how old you are or how young you are. It does not matter how rich or poor you are. When it is your time for sickness or even death, there is nothing you can do. We came back home a few weeks ago from the Bi-Vocational Council Retreat Planning Meeting, where we share, discuss and plan for the next retreat. At the meeting, we discussed how the newer generation is a "doing generation" and not so much a "planning and discussing committee." HOW VERY TRUE IS THIS? My generation grew up sitting around and planning and discussing the things we could do for the Lord. Most activities and missions were successful because of weeks and months of planning and discussing. Today's generation says to forget that! They want to not talk about it but DO IT. While that mentality is taking a bit of getting use to for some of us old timers......it is making a lot of sense. An example of this is a couple of guys at our church felt lead to go to the inner city and play basketball with the project kids. Now....since it is in Rockwood, that just means that they go down to the public, outdoor basketball courts and play ball with the project kids. They have been ministering to them since the first of the year. Many of these project kids do not have a father figure in their lives. They play ball with the boys and minister to them. Then, on Sundays, they pick them up and take them to church. Even the older boys do not have cars or anything. Since the first of the year....one of those 14 year old boys accept Christ as his Savior, joined out church and was baptized. An 18 year old had been out of church and started attending our church and joined. Sunday, a 19 year old joined our church and will be baptized in a couple of weeks. ALL because two guys felt the call and DID IT. They did not sit around and plan or even discuss it. They got up and DID IT. Another example of this is....the young guy that joined our church Sunday morning, shared that it was a tough weekend for him because he lost his mother three years ago. Tuesday, of this week, his dad was rushed to the hospital. He had a heart attack and had a touch of pneumonia. Yesterday they transported him to Oakridge for Heart Surgery. Yesterday.....on the spur of the moment, our Young Married Couples class got together and literally threw together some quick meal for the young man and his teenage sister. Now, my generation would think we had to cook up a nice meal and bake from scratch a dessert, etc. These young ladies.....had several nights worth of meals whipped up in no time. They made spaghetti and chicken casserole, etc. Then they bought snacks and drinks for them. Ta-Da........they saw a need.................threw it together.........and the FAMILY appreciated it very much. Being at our church going on 19 years.....I love how the younger ones learn from the older ones. BUT....I also love how the younger generation is teaching us to DO IT. CHANGE. That dreaded word. I am showing my age, because, usually, I DO NOT LIKE CHANGE. However....I have realized that even though I bulk change, many times, change is good and makes me feel better. Doesn't it feel good to re-arrange your pictures.......or your furniture.....or clothes? It makes me feel so much better after it is over with. Yesterday, in the mist of all of the stress, I had a much needed hair appointment. I had worn my hair in a bob for many years and for the last six months, my hair dresser had talked me into letting it grow out. Well.....YESTERDAY.....I was OVER IT. I was ready for a change. That is a dangerous thing when I already have a hair appointment. I walked into the shop and said I am ready for a total change........you choose the cut, style and color. I asked for it, so I got it. This girl won't be wearing pony-tails to keep the hair off her neck anymore.....................I have not hair. Well, I do have some, but it is VERY short. Not a style I have ever worn before. I don't HATE it and I don't LOVE it...............I am getting use to it. Smile. It was such a SHOCK. I asked for it and I got it. On a different note.......pray and believe..............ASK GOD....and ye shall receive. Many times we do not receive the blessings that God has set aside for us because we do not ask. But, also, be careful what you ask for.............because YOU MIGHT JUST GET IT. OOPS! What can I say? Being a school teacher and the lead teacher for grade level, this is an EXTREMELY busy time of year. Last week was T-CAPS.....this week was Social Studies 6th grade pilot T-CAP test on the computers. I did not think one bit about it being my week to blog..............until I decided to check it out and read a little while I am taking a breather before church. WHEWWWW........THAT was when I realized that this is my week and I was being lazy. I LOVE teaching, but every year at the beginning of the year and at the end of the year, I question my calling. I LOVE teaching in the middle of the year. Smile. Not only is it the end of the year.....we just finished with Mother's Day....and Dayton's Strawberry Festival was last week and weekend.......which is HUGE......and I am recovering from an upper respiratory infection. YULK. I am sooo ready to have a couple of months off to relax. RELAX???? What is that? As soon as school is out, it is time to get ready for V.B.S. and Fishers of Men.....and who knows what else. SMILE. REALLY....I am not complaining.......I am just writing down how busy I am and I KNOW YOU are equally as busy. When I write it down, I really wonder how it all gets done, but.......somehow it does. Okay....now that I got that out....................let's STOP and BREATHE!!!!!!!!! Paul wasn't writing to the pastors and/or their wives in Ephesus. He was writing to the church there. He was writing to ALL the believers in that ancient city and he was writing to us. As Christians, we are all "called." In all honesty, in my 20s I sinfully and self-rightously felt that somehow my "calling" into ministry made me better and somehow closer to God than some one who wasn't "called" like I was. I would have never said that, but that is how I felt. I've met and known and served with other ministers' wives that carried themselves down the church halls as if they were royalty, expecting special treatment and favoritism. I've watched "lay" ladies seem to compete to be included in the "in" crowd with these at the women's ministry events. I've seen other ladies leave events like that feeling defeated as though they could never measure up spiritually to be like these "called" ladies. The longer I follow Christ and the longer I live as minister's wife, I have learned a great deal about judging others. I don't jump to (or at least linger on) the same conclusions. I don't know how my sister minister's wife feels, where she has been with the Lord, or what He is teacher her now. However, I do just want to remind her, that we are all "called." None of us are closer to God because we are married to a preacher or youth pastor or "next gen" guy. None of us are more spiritual because of a "calling" to ministry. We are all "called" to lay down our lives, pick up our crosses and follow Him. We are all "called" to live holy, blameless lives. At a recent event for ministers' wives for our local association I was blessed as I got to know one of our more "senior" attendees. Her pastor husband is now officially retired, but is still very actively serving one of our churches here in Montgomery County. She is still faithfully serving by his side over 50 years after she became his bride. I soaked up my time with Mrs. Ann and eagerly accepted her Facebook Friend request she sent me that night when I got home. I listened attentively to her experiences and wisdom from serving so long in so many places but I was most fascinated with the story of her "calling" and the night she met the man who would be her husband. Ms. Ann very vividly remembers feeling "called" by God to be a preacher's wife. She was so certain of it that when a certain young man approached her, asking for permission to take her on a date, she told him in no uncertain terms that he needed to know that she was to marry a pastor. This young man shared that though he was employed as a teacher that God had his heart and that He too had a "calling." He was "called" to pastor. Maybe like Ms. Ann, you knew from a young age that you were "called" to be a minister's wife. Maybe like me, you knew you had a God-given passion for ministry and while you weren't sure what that looked like, you were "called" to share that with your spouse. I know another minister's wife who is adamant about the fact that she was never "called." He was. She has been very vocal in the past that she didn't sign up for this. The stability and income that he had before is sorely missed and the microscope she and her kids have been put under is greatly resented. Maybe you once felt "called," but after all you've been through you find yourself doubting if you heard God right. Regardless of how you got here, here you are. You are a minister's wife- whether you were "called" or not. Despite your path here, your memories of a "calling," or your current feelings, our Soveirgn God has allowed you this label of "minister's wife." But before all that, you were made His. He "called" you. He made you His. You were bought at a very high and costly price. You are no longer your own. That is the greatest label you can wear. You are first and foremost a Christ follower. You are SO much more than a minister's wife. You were "called" to so much more. Pay Attention to the Symptons! For months our bathroom sink would not drain. Surely you have experienced such a thing….you know the scenario….you brush your teeth only to be disgusted with the pooling, spit, toothpaste filled bowl of water. My not-so-handy-around-the-house husband came to the rescue with a ginormous bottle of liquid Drano. Sure enough….it did the trick. For a while, that is. Then, before we knew it….there was the nasty filling up of the sink. Time passed and many other bottles of Drano were depleted and our sink was still stopped up. No worries!! We will simply not use the bathroom sink!! We will use the kitchen sink to brush our teeth and do whatever else we might need a bathroom sink for. Problem solved!! Until we noticed the black goop backing up in to our never used, humongous garden tub (and I know why they call them garden tubs….because for the non-bath taker….it takes up way too much space and would be better served as a garden!! In the back yard!!) Disgusting. Yuk. What to do??? We decided it was time to call the plumber. After all….why call the plumber when you can use the kitchen sink?? Right? However, this new dilemma caused some concern. Mainly because this garden tub is the size of a garden and I cannot reach to the bottom or to the other side where the faucets are to clean the worthless pit!! In fact, for years, all I have done is dust it!! With a long stemmed duster, of course! So, the plumber is called—the nice lady on the phone duly noted in their system that we have a clogged sink and to please bring unplugger tools. Simple problem. Simple solution! Come to find out…we have a much bigger issue than a plugged up drain. Oh yes we do! The plumbing under our kitchen sink is missing about 10 to 12 inches of pipes! Yep! All of that tooth brushing spit was going right underneath our house in the crawl space. (many Indiana homes have crawl spaces…if you need to know what that is….I am sure you can google it)….not to mention everything else that has gone down our kitchen sink and garbage disposal for who knows how many years!! Yikes! Yuk!! Double Yuk! Everything that went down our drain went underneath our house instead of out to wherever things that go down drains are suppose to go! Nice huh? But that’s not all….oh, no….there’s more! The same ‘issue’ was found in the bathroom plumbing!! More pipes that are not connected!! What in the world?? How does that happen? How did we not know it was happening? Why didn’t we do something about our stupid drain sooner and found this out? My Lord taught me something very significant as I wrote the ginormous check to the very happy plumber who replaced ALL of our plumbing throughout the entire house. Things can seem fine but they really are not. Our drainage issue was a warning that something was not right…something very big….but we ignored it. Lived with it. Did not deal with it….and lots of damage was incurred because of it. Many of us look like everything is fine. Act like everything is fine. All of the while ignoring the symptom/s that is indicating something is definitely not fine. Ask the Lord to show it to you. As painful and costly as it might be to ‘fix’ the issue/sin….it will be worth it!! In the process of determining what was wrong, they also discovered lots of water damage in our bathroom and had to tear out lots of the tile around the dearly unbeloved tub. 1-800 water damage came in and destroyed our bathroom in order to dry it out. Lots more money and lots more time. Oh, and the floor? What we thought was tile all of these years, discovered it was peel and stick tile that was grouted over the seams!! What in the world?? Faked us out that’s for sure!! 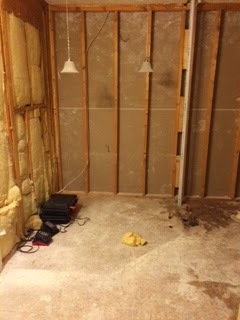 Once the new plumbing was in and the drying out was completed….we could then put the bathroom back together. Here’s what the Lord allowed us to do. Get rid of the unbeloved garden tub and replace it with a beautiful shower!! We replaced the old shower with a much needed closet!! And we now have double sinks!! Yes!! No more pushing and shoving and spitting on each other!! Oh my friend….what started out as a disaster many, many months ago….is, as of just last week, a beautiful new remodel!! Don’t ignore the symptoms that something is wrong with your marriage, your children, your ministry, your health, etc. (Don’t be paranoid either….be wise). Perhaps the Lord is wanting you to look beneath the surface and see the Truth about things. Don’t be afraid of the truth…remember, the Truth sets you free!! AND He is in the remodeling business!! He wants to take marriages and children and ministries and all of it and make it look like Him!!! Beautiful! It might take a little time. It might hurt for a while. And it might cost you something. But it will all be worth it!! !